Mental Health Professionals generally assume that case records and documents will remain confidential. 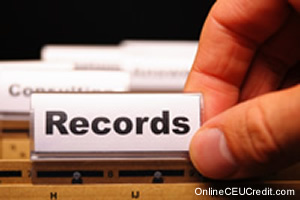 In reality, there is no such thing as a truly confidential case record. An extraordinarily wide array of laws, regulations, contracts, and court rules require or permit disclosure of otherwise confidential documents. Furthermore, Mental Health Professionals need to be cognizant of security risks associated with the widespread use of computers to store confidential records and documents. Thus, Mental Health Professionals should be very familiar with the various circumstances under which records and documents may be disclosed. Practitioners need to know how to respond to subpoenas, be familiar with applicable state and federal laws and regulations, and secure documentation for future access. Mental Health Professionals should not release any confidential information contained in documents unless they are sure they are authorized to do so — based on client consent or in response to a court order, for example (Polowy & Gorenberg, 1997). Know Relevant Statutes and Regulations. There are many federal and state statutes and regulations that govern the handling of confidential documents (Dickson, 1998). For example, the federal Health Insurance Portability and Accountability Act, or HIPAA (P.L. 104-91), and its regulations address the protection of personal health-related information. Mental Health Professionals should be especially familiar with explicit HIPAA provisions that are unique to psychotherapy notes. The regulations define these specifically as notes recorded in any medium by a health care provider who is a mental health professional documenting or analyzing the contents of conversation during a private counseling session or a group, joint, or family counseling session, and that are separated from the rest of the individual's medical record. Other key federal regulations govern the handling of confidential documents related to alcohol and substance abuse treatment (42 C.F.R. Part 2, Confidentiality of Alcohol and DrugAbuse Patient Records) and school records (34 C.F.R. Part 99, the Family Educational Rights and Privacy Act, or FERPA). States also have specific laws and regulations governing the release of confidential documents contained in health, mental health, school, and child welfare records (Dickson, 1998). Secure Records. Mental Health Professionals should store records (clinical, personnel, supervisory, and administrative) in secure locations to prevent unauthorized access (Barsky & Gould, 2002). When using electronic media, practitioners should exercise caution to ensure that this information cannot be accessed by unauthorized parties (see NASW Code of Ethics, standards 1.07[l],[m). Mental Health Professionals should consult relevant federal and state statutes, regulations, codes of ethics, and contracts (for example, insurance company and managed care contracts) to determine the length of time that documents should be retained. If and when records are destroyed or disposed of, care must be taken so that the disposal still protects client confidentiality (Barsky & Gould, 2002; NASW, 1996). Mental Health Professionals' understanding of the relevance of documentation has dramatically evolved. Once a simple theory building, research, and teaching tool, documentation has transformed over time to incorporate detailed and sophisticated standards for clinical and other direct practice settings. As Mental Health Professionals navigate a new landscape of practice, enhanced service delivery requirements, and fast-paced technological innovation, documentation for risk-management purposes has risen in importance. To comply with current ethical and legal standards and to protect clients and themselves, Mental Health Professionals should conduct thorough assessments of their documentation policies and procedures. Independent and private practitioners, who do not need administrative approval, are in a position to modify their own documentation policies and procedures to comply with prevailing standards. Mental Health Professionals who are employed by agencies may have less authority to make needed changes; they can share their concerns about documentation policies and procedures with administrators and advocate for change. The preceding section contained information about the HIPAA standards and their effect on documentation in mental health. Write three case study examples regarding how you might use the content of this section in your practice. In regard to the HIPAA confidentiality standards, what should Mental Health Professionals be especially familiar with? Record the letter of the correct answer the Ethics CEU Answer Booklet.